A set of two (2) SGC-25-1005 filters. The SGC-25-1005 filter cartridge (2.5� dia x 9.875� L) is made of 100% melt-blown polypropylene (PP), but the filter is grooved to allow for larger surface (and therefore filtration) area for longer performance life. The 5-micron sediment filter has low-pressure drop (i.e., 0.1 psi for 1 gpm flow), high chemical resistance, and high dirt-holding capacity. 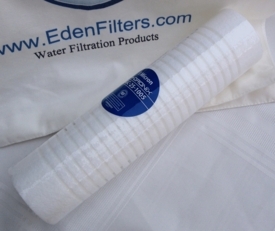 This filter cartridge can be used as prefilter in RO systems or as post filter after GAC filter. The filter cartridge is shrink wrapped for extra protection during storage and handling. The HDG-SED-AC5 filter is compatible with the following sediment filter cartridges: 3M Purification AP110; Aqua-Pure AP110, 55410-14, 55410-15, 55410-16; Cuno CFS110; Watts FPMB5-978; Whirlpool WHCF-GD05, WHCF-DWHV, WHKF-DWHV, WHKF-GD05. This replacement filter cartridge can also be used in point of entry housings that accommodate 2.5" x 10" cartridges including AP11T, AP101T, AP102T (takes two AP110 cartridges). The Hydronix SGC-25-1005 should to be replaced every 6 months for optimal performance.